Grant and I wound up having to hit the Sub Pop 20th Anniversary Comedy Show without dinner in our stomachs last night, so we used my precious iPhone to locate some late-night grub. (By the way, the Citysearch Web app for the iPhone is pretty darn handy, if not 100% accurate.) 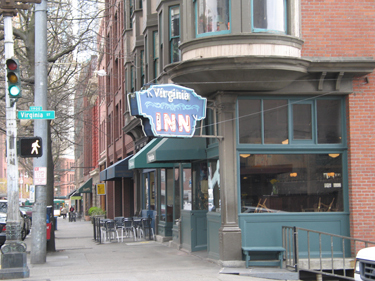 We stumbled into the Virginia Inn (aka “My Inn”) fifteen minutes before the kitchen was going to close, and the staff were all super-nice and accommodating. We recalled that the VA Inn had been closed for a while since they were expanding their kitchen, so we were hoping they’d have a decent selection of actual food, and not just bar fare. And it turns out, we were right! I ordered the “Steak Frites” and requested it medium rare, thinking I might get a dried-out slab of charred flat-iron and some blah fries. But what I got was a thick, small but hefty, perfectly Pittsburghed (charred on the outside, rare-but-not-chilly on the inside) filet mignon chop, and some of the most superbly prepared potato strips I’ve ever tasted — for a total of $22. Oh, how I wish my iPhone battery hadn’t died, so I could post a photo! For greasy pub food, I had a meal that rivaled the stuff one could get from The Met for three times the price. I was blown away. I’m definitely mentally re-bookmarking my inn as a place to head back to. I’m so glad they’ve re-opened! Grant and I recently subscribed to Seattle Metropolitan, just in time for the “Hot Breakfast Spots” issue. While I was frustrated that a bunch of things were reported wrong (like hours of operation and menu items), we were still thrilled to have a good breakfast/brunch guide, since it’s our favorite going-out meal. We decided to give The Georgian at The Fairmont Olympic Hotel a whirl, since it was caucus day and it was right around the corner. Figuring it’d be swamped with other people who had the same idea, we called ahead to make a reservation. There were all of three tables in the giant English tearoom-styled dining hall, so I guess everyone else caucused hungry? Their loss! I expected the Georgian to be a bit stuffy and awkward, given that it’s a snooty hotel whose restaurant is usually frequented by top-dollar execs on business travel. But while the atmosphere was a bit stiff, the food more than made up for it — they had a very natural and local menu with lots of organic items, and there were several interesting combos like a lobster chipotle Benedict and some killer omelet additions. But what really wooed me were the eggs. I ordered them “over medium”, which usually means “still totally runny yolks” at most joints. 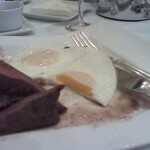 But the Georgian hit the PERFECT balance of egg yolks that are neither runny nor hard and opaque. Plus, I ordered the breakfast flat-iron steak medium rare, and it wasn’t totally cooked to a brown unrecognizable jerky like most breakfast steaks tend to be. And lastly, the treat. I usually have to avoid sweeter breakfast delights like French toast and waffles, because the carb-tastic options do a number on my blood sugar. Opting for protein-rich selections is the only way I can guarantee the meal will last me more than an hour, sustenance-wise. 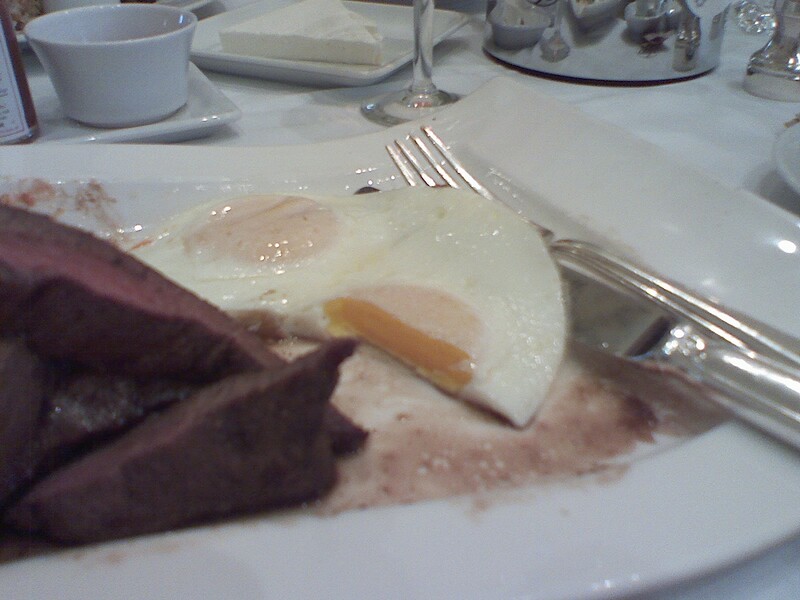 So I was thrilled, after ordering my steak-eggs-and-hash-browns combo, to spot a little white pot of something baked. It turned out to be a tiny spiced pumpkin bread type coffee cake — just enough sweet treat to let me know I didn’t have to miss out on the fun, without screwing up my protein-heavy intentions. All in all, this was one of the best brunches I’ve had in a long time. And we go out to brunch a LOT, and we’ve been checking out more and more spots since Seattle Met tipped us off to our options. Best of all, there didn’t seem to be a single error in the magazine’s reporting on this spot — there was a fresh-made juice of the day, there was a great selection, and there were no major surprises or disappointments when it came to hours of operation or menu offerings. And the eggs “over medium” really were over medium. I couldn’t ask for more!